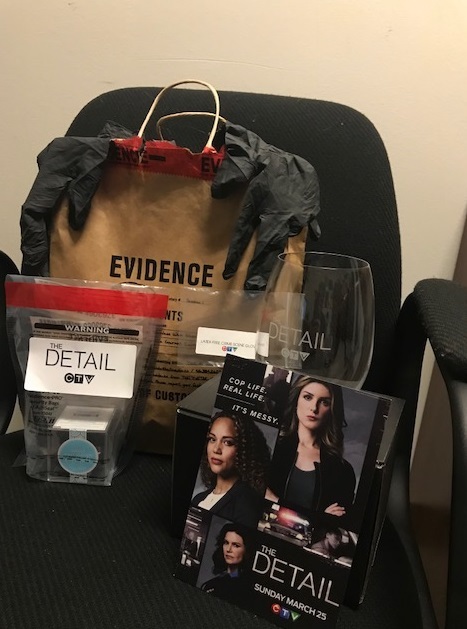 Evidences were sent to my office today for this upcoming CTV show called “The Detail”, which premieres this Sunday, March 25 @ 9:00 pm ET on CTV & CTV GO. The Detail is a bold, original, female-driven detective drama series on CTV & CTV GO. The Detail starring the talent trio of female Homicide Detectives Stevie Hall (Angela Griffin, CORONATION STREET) and Jack Cooper (Shenae Grimes-Beech, 90210, DEGRASSI: THE NEXT GENERATION), under the supervision of Staff Inspector Fiona Currie (Wendy Crewson, SAVING HOPE, Room). Let’s unbag this together & find out what evidence is inside. Follow hashtag #TheDetail for more evidences & join the journey. Also click here to check out the preview of The Detail on CTV and CTV GO. Check out my UnBag Video here on the evidence bag that I received at my office today.